I had a deal with myself. Imma gonna stay away from pakodas all monsoon. Because they are an addiction, the kind which makes you put on lots of weight so you don’t fit into your pants anymore. But ahem, the food blogger in me was urging me (forcefully, I may add) to give you monsoon snacks. I almost gave in. But resisted enough to bring to you not fried, but these super crispy BAKED onion pakodas or fritters or bhajiyas or whatever you like to call them! And now we can safely stuff our face with them. They are almost like the real deal. I say almost because they get super crisp in the oven and all brown around the edges etc. but just take slightly longer which means you and I have to wait. But that’s okay right? We can have an extra cup of chai while we wait. 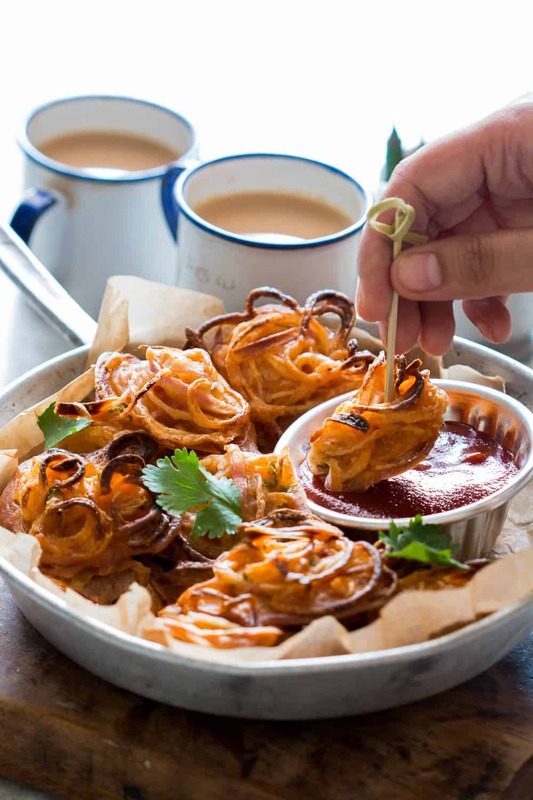 Because that’s what we do – eat onion pakodas and have a cup of chai or two. All day long. Honestly I was a bit nervous about sharing this recipe. Because some of you may just laugh in my face. I mean this goes against all rules right? Pakodas have to be fried. But the fried kinds make me real fat. And I don’t like that. Neither do you. Which is why we need to take a step in this direction. It’s the right direction folks, trust me. I’m going to share all my secrets to making the best pakodas in the oven and then you and I will never have to go back to the fried kinds. Liar. Use thinly sliced veggies. I actually spiralized (Buy a spiralizer here) my onions so that I get them super duper thin. That ways they cook faster and crisp up real nice. Use a mixture of besan (chickpea flour) and rice flour. The chickpea flour binds nicely and the rice flour adds extra crispness. Be patient. Because this takes about 22 minutes in the oven. But it’s all worth it. This baked kind will not work with juicy veggies like tomatoes but I can totally see some capsicum, corn, chilli pakodas in my future and maybe yours, if you all are nice to me. If you end up trying these out, tag @my_foodstory on Instagram and share your delicious pictures with me. And for more party food inspiration, follow my appetizers board on Pinterest! 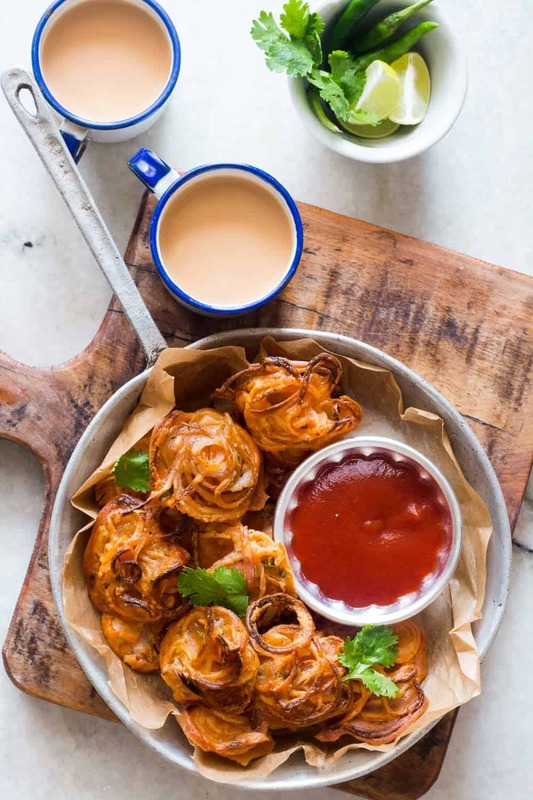 You will never believe these onion pakodas or fritters are baked in the oven and not fried! Now you’ll never have to say no. 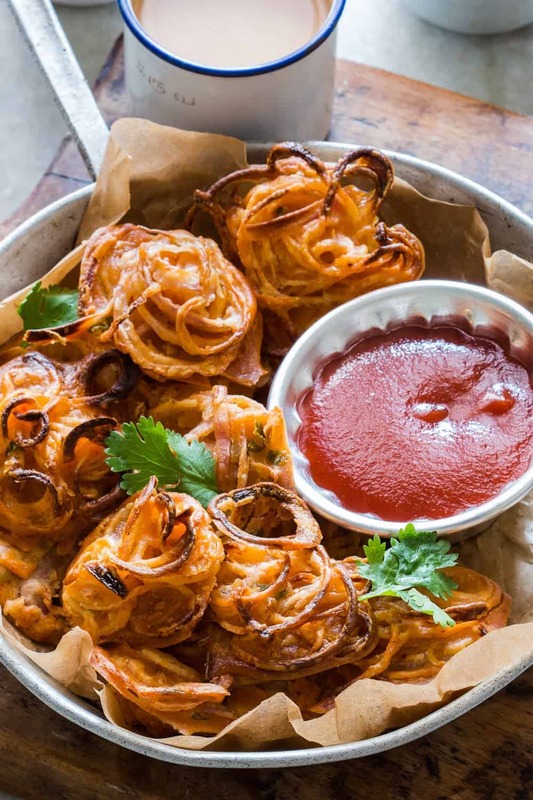 Enjoy the crispiest baked onion pakodas guilt-free anytime you want. Pre-heat oven to 200C. Line a baking sheet with a silpat or greased parchment paper. Combine all the ingredients in a bowl till there are no lumps. The batter might be slightly runny which is okay. It should just about coat the onions. 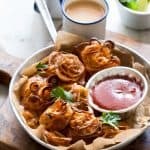 Take a tablespoonful of onion batter at a time, shaking off any dripping batter and place them on the sheet at equal distance. Bake in the oven for 22 minutes till cooked through and the top is golden brown. Half way through, at about 15 minutes, brush the pakodas with oil and continue baking. Serve immediately with ketchup and coriander chutney. Storing these onion pakodas for later makes them soggy so eat immediately. Which is not a problem if you like to stuff your face like me. You make me laugh, & yes I WILL try some of your recipes! Your blog made me laugh. Sadly my pakoras did not come out crispy enough so I shall be frying them later. They look great though. I fear that frying really is the only way for some things…..
Sunila did you grease the parchment paper? Also, I have recommended silpat which is a sure shot way to make sure pakodas don’t stick. I love adding a bit of rice flour to things that I fry- works well in samosa dough too. These baked pakodas look so crispy. Love them! Who can deny those Onion bhajiya’s….. Moreover when they are baked..
Love the images Richa. The pakodas look so apt for the weather! Amazing fritters Richa.. Awesome clicks too. When u bought the spiralizer I knew a lot is going to come 😀 . Loving those crispy brown roses, so well presented. good for diabetic people. great substitute almost the real thing.